Labelling in conformity with Regulation EU-GHS/CLP will be mandatory with effect from 1 June 2015. The purpose of this is to achieve global uniformity: GHS stands for Globally Harmonized System of classification and labelling of chemicals. The European variant is called EU-GHS/CLP; CLP stands for Classification, Labelling and Packaging Regulations (Standard: EC 1272/2010). Products manufactured prior to 1 June 2015 are subject to a stock clearance period up to 1 June 2017. 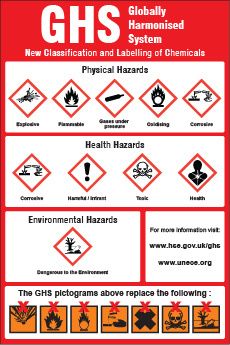 • New hazard symbols and warning texts on the labels of classified products. • Stricter classification of products designated as being hazardous. • New Safety Data Sheet layout. The Lubrita has over 500 products (mixture) that we regularly produce and we use a large number of raw products for this purpose. The blending ratio and the hazard classification of the various raw products ultimately determine the hazard classification of the end-product. On this point we are currently holding intensive talks with our suppliers in order to obtain the latest information. In the current system it may be sufficient, for example, to indicate that an additive contains less than 10% of a classified substance. Under the new Regulation, 8% can lead to a hazard classification for the end-product, whereas this would not be the case for 2%. In many cases we have already received sufficient information from our suppliers, but some suppliers have been asked to provide a more detailed specification of the data. Together with our suppliers' technical specialists we are also looking into whether high quality alternatives are available. We are doing this to minimise the number of products given a hazard classification. It is also problematic that from 1 June 2015 some products, which have been used without any problems for years, are suddenly given a hazard classification under the new CLP. Products with a viscosity lower than 7 mm²/s at 40°C are already classified as hazardous. This limit is being extended to 20.5 mm²/s, which means that products with ISO VG 10 and ISO VG 15 are now also given a hazardous classification. Based on the information currently available to us there are a number of Gear Oils that are very likely to be given a hazard classification. The composition of the product remains the same but the label will now all of a sudden have a warning stating that the product is hazardous. This could lead to confusion and concern among your customers, certainly if we switch over now while our competitors wait until the last moment. Concern for the environment is rightly a point of attention and for that reason products not included in a hazard classification will usually be chosen. It is hard to explain that a product that is currently unclassified could be classified as being hazardous from 1 June 2015. As indicated above we are working hard on preparing for the introduction of the CLP Regulation and obviously we will also be helping our customers with this. We will shortly be sending you a newsletter providing more information about the differences between the situation as it stands and the situation from 1 June 2015. We will certainly also be providing you with more information and advice at a later stage in order to ensure that the transition goes as smoothly as possible. If you have any questions please contact info@Lubrita.com. We will refer your questions to our specialists.